Brackley Town boss Kevin Wilkin will want to avoid back-to-back defeats ahead of the club’s Buildbase FA Trophy tie. Saints go into Saturday’s Vanarama National League North clash at Kidderminster Harriers still smarting from only their second defeat in 16 outings. It came against in-form Altrincham at St James Park and Saints have now lost ground on the pacesetters. Wilkin said: “Up to Saturday’s game, we had only lost one in 15 but we hadn’t taken enough points during that run with too many draws. From a winning perspective, we’ve not done enough and that’s why we’ve fallen away in recent games. Harriers were the early season pacesetters but have been pegged back in recent weeks. However, Wilkin is still expecting a tough test on Saturday before his side’s FA Trophy tie the following weekend. He said: “It was a long time before Kidderminster lost a game but since then they have lost a few in succession. If they had kept going like they were they would have got to the top. They’ve been rocked by recent results but it will still be a tough place to go, it always is. 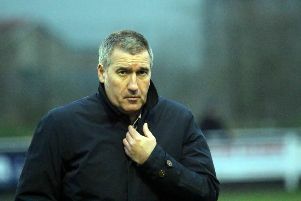 “We don’t want to go into the FA Trophy tie with back-to-back defeats. There will be plenty of challenges for us to deal with on Saturday but if we get back to what we’re capable of then there should something in the game for us. “We’d rather be in this position, trying to prove ourselves week-in, week-out, than at the other end of the table. I knew it would be the toughest test on Saturday so far for us and so it proved. “We had a similar record to Altrincham but they were the best side we’ve played. I felt that would be the case before the game and that’s how it panned out.